On Oct. 16, 2004 during the NASCAR NEXTEL Cup Series race at Lowe�s� Motor Speedway, Joe Nemechek and the No. 01 U.S. Army racing team will be backed up by a "Real American Hero" � G.I. JOE. As part of the 40th anniversary of Hasbro, Inc.�s G.I. JOE brand, Nemechek�s No. 01 U.S. Army Chevrolet Monte Carlo race car will include special imagery devoted to an American icon and boyhood rite of passage. However, before the racing action begins in October, MB2 Motorsports, Action Performance Companies Inc., the No. 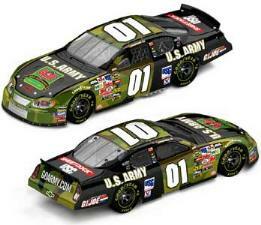 01 U.S. Army Racing team and Hasbro�s G.I. JOE brand will honor other "Real American Heroes" from the U.S. Army, with a special event hosted today at the Lake Mirror Complex Amphitheater beginning at 11 a.m. The event will include the formal unveiling of Nemechek�s No. 01 U.S. Army/G.I. JOE Chevrolet Monte Carlo. Action Performance Companies Inc., a leader in licensed motorsports merchandise, is producing the commemorative die-cast replicas of the No. 01 U.S. Army/G.I. JOE 40th Anniversary 2004 Chevrolet Monte Carlo. The collectibles, as well as other related memorabilia, will be available through Action�s usual distribution channels, including the 17-member ARC distributor network and the exclusive RCCA collectors club. To locate an ARC distributor, please call 1-800-411-8404. To join RCCA, call 1-800-952-0708 or visit goracing.com. "This has been such an important time for all American soldiers," noted Fred Wagenhals, Action Performance�s chairman, president and CEO. "Anything that we can do to honor their dedication and sacrifice, even in a small way, is worthwhile. The G.I. JOE brand�s 40th anniversary happens to come at a time when the significance of expressing patriotism and courage is especially poignant. To share the unveiling of Joe Nemechek�s No. 01 Army/G.I. JOE Chevrolet with local military heroes in Lakeland is a way to express our support to the real-life heroes who inspired the creation of Hasbro�s G.I. JOE brand."